Deb told me immigrants from Poland tended to be Catholic. Hermann Mangels was a German Lutheran. To marry her husband in his church, Deb believes Maria would have had to covert from Catholicism. She said there could be records of that act in the records of one of those churches. 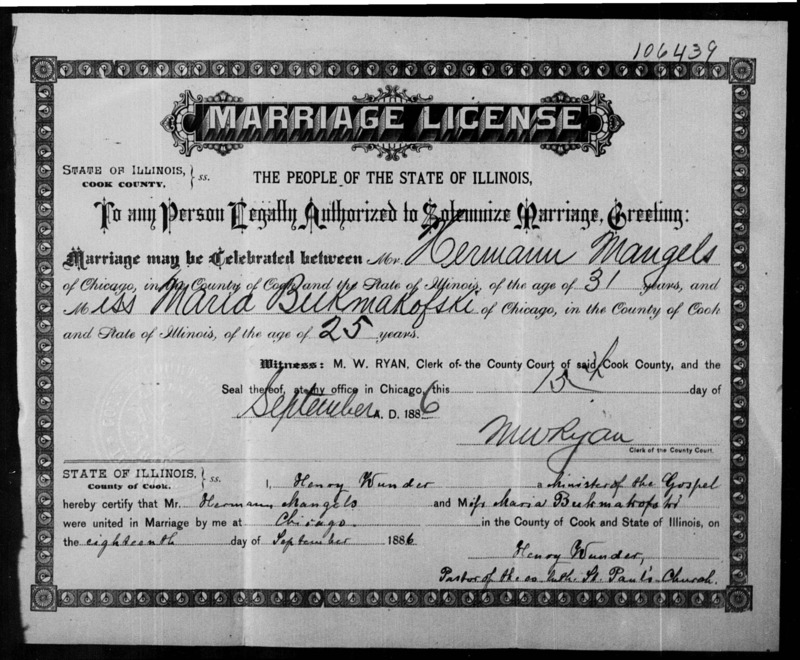 The wedding took place in St. Paul German Evangelical Lutheran Church in Chicago. According to page 35 of the 1885 Chicago City Directory, the church was located at the corner of Superior and North Franklin streets. There are some records from this church on microfilm at the Family History Library. Note to Self – CHECK THE FHC FOR THIS FILM. In addition to learning more about Hermann and Maria, I’m also interested in Hermann’s first wife. Helena Reichsnagel Johannsen Hahs Mangels* died eight months before Hermann and Maria were married. Her death may also be mentioned in the church records. Note to Self – LOOK FOR AN OBITUARY FOR HELENA. 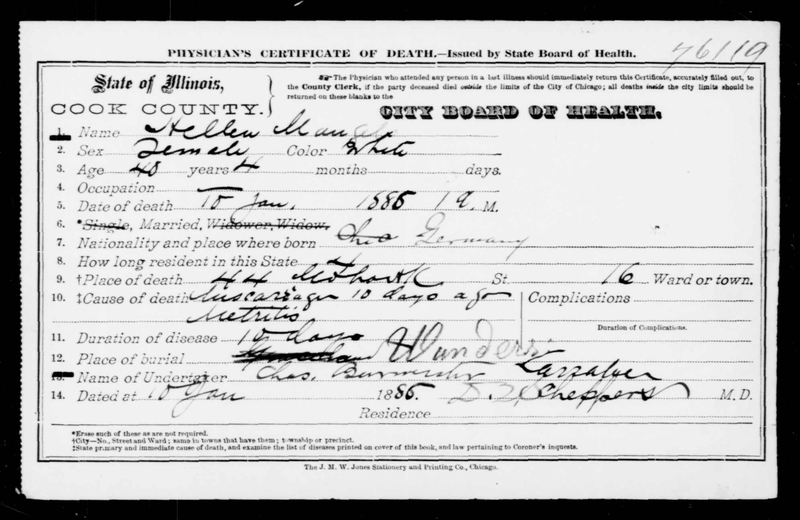 The street address listed on Helena’s death certificate matches the one listed for Hermann in the 1885 Chicago City Directory. Wunder’s Cemetery was named for Rev. Henrich Wunder, the pastor who married Hermann and Maria. Note to Self – CALL THE CEMETERY FOR A PLAT CARD. Could Maria have been a maid in the Mangels’ household when Helena died? Is that how she came to marry Hermann? *this is the name given for Herman’s first wife in the letter Alice Farkas wrote to her cousin Louis in 1987.